When we remember an old favorite or find a new recipe we like, we’ll share! Mix 2 1/2 cups water with 2 1/2 cups cider vinegar and 1/4 cup pickling salt in saucepan and bring to a boil. 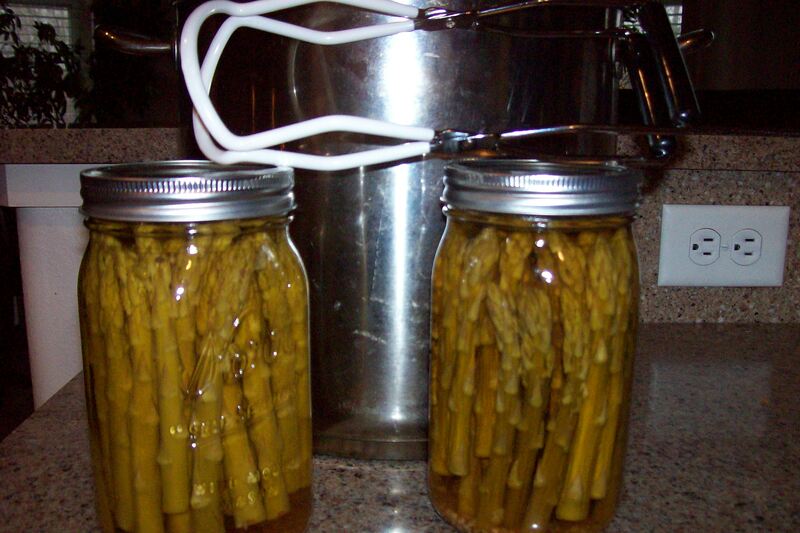 **Note – the recipe I found says this will do 7 quarts but it is not true and I had to make up additional water/vinegar/salt solution to finish my jars – but that is ok as it is very simply done. Just make up batches as you go. 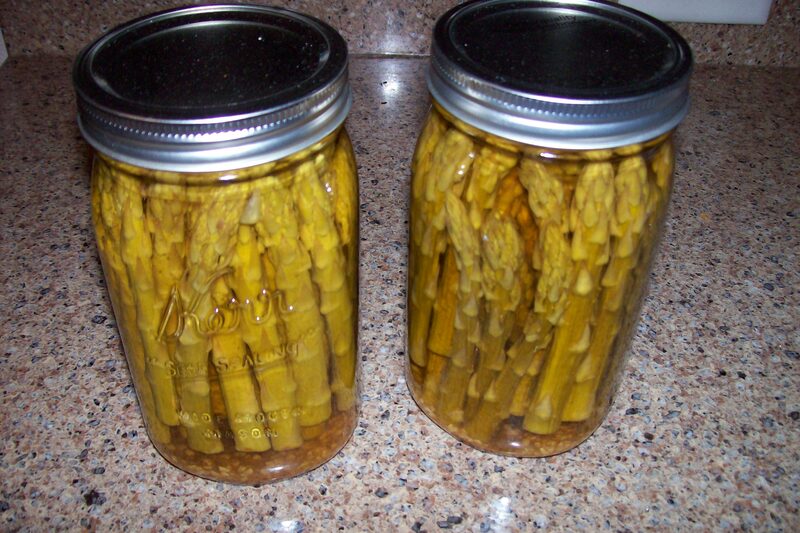 Cut your clean asparagus into lengths that will fit in the jars (I do not keep the bottom woody parts and am going to put them in the compost pile) put a handful in the jar -whatever will fit through the opening at one time. Then I have found that if I tilt the jar onto its side and shake a bit the spears will settle down and leave room for you to put in more. You will want to pack the aspargus in there as tightly as possible. Once you have it packed full then add the spices to the jar. Then you can pour the vinegar/water/salt mixture over the top, filling to within ½ inch of the jar top. Wipe down the rim and apply the lid/ring adjusting it to only finger tight. 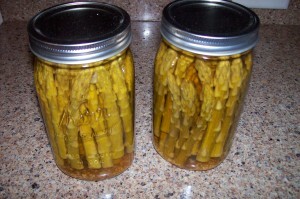 You will process these in a water bath for about 11 mins. Carefully lift the jars out after the allotted time and place them on a towel with another towel over the top so they don’t cool too fast and wait to hear the lovely sound of seals sealing. pop pop pop – love this as it means I have done my work well and the items are ready. 2 of the 10 jars next to the water bath kettle.